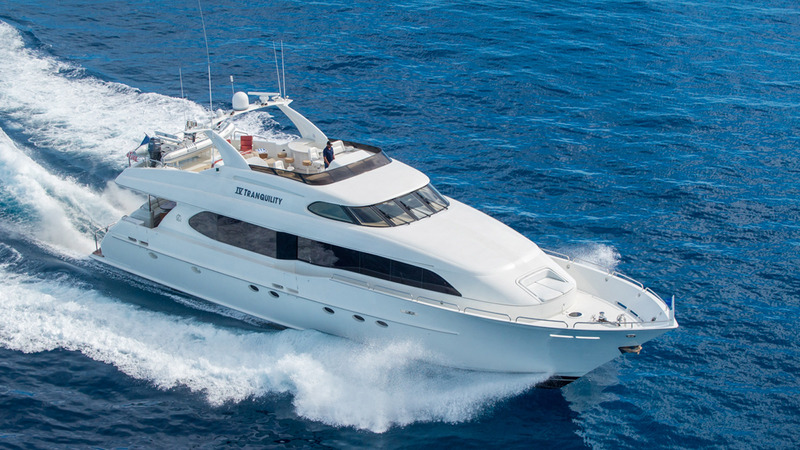 Built in 2001 with a refit between 2018 & 2019, yacht IV TRANQUILITY is well-suited for families with young children cruising in the Bahamas and New England. Boasting an elegant three stateroom layout, plus a private den which can comfortably sleep two extra guests, if needed. Best suited for young children. The den is adjoined to the master stateroom and shares the ensuite master. IV TRANQUILITY features include a spacious flybridge with a Jacuzzi, bar and grill, a raised pilothouse with excellent sight lines. Elegant salon & spacious aft deck, and transom pods with wave runners. IV TRANQUILITY has a large country kitchen style galley with a large U-shaped dining table, the perfect area for a light snack. Forward is the crew quarters with two staterooms and two heads. The decor theme is accentuated by a hi-gloss cherry wood treatment, which is found throughout the vessel.